This study is focused on digital technologies in the operating theatre and their potential for improving clinical care and training. Increasingly, operating theatres are equipped with a range of different recording devices, including laparoscopic kit, light handle cameras and wide angle cameras and microphones. In most hospitals these devices are not (yet) routinely used to record and analyze operations. The laparoscopic view may be commonly recorded and disseminated (e.g. through Youtube), but there are no frameworks available to systematically analyze them. 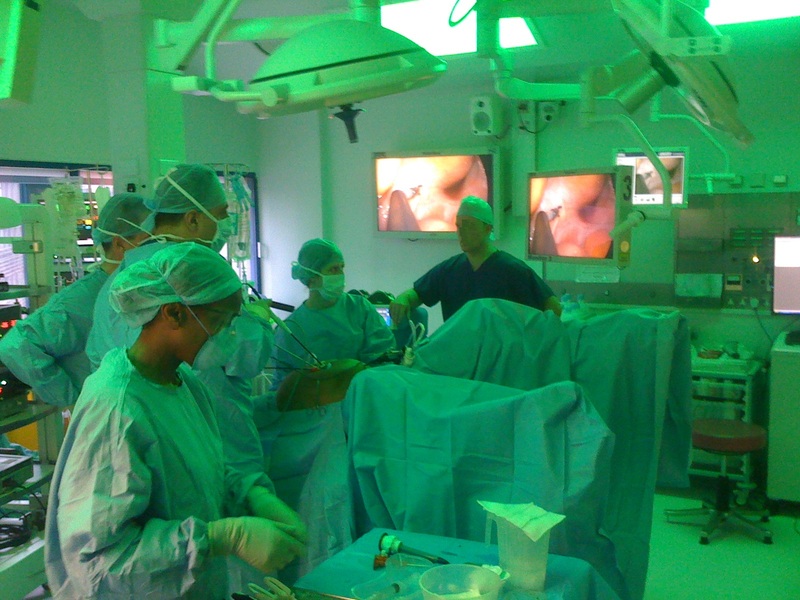 Cameras in the operating theatre are sometimes used for, e.g., tele-surgery, live demonstrations for educational conferences, and occasionally for research purposes, but they are rarely used by the professionals working in the operating theatre themselves, e.g. for debriefing purposes. The study will explore the potentials and constraints of such usage of digital recording devices and develop methods to analyze recordings of surgical operations for educational, organizational and clinical purposes. It will draw on a sample of audio and video recordings of pre-, intra- and post-operative activity in the operating theatre. The investigators on this project are Jeff Bezemer (Principal Investigator), Gunther Kress and Roger Kneebone. Listen to a podcast about this project. In this quarter we have written up our study on touch. Our aim was to develop new insights in ‘touch, within the frame of Social Semiotics. Taking examples from different domains and communities of social practice, ranging from shoulder tapping, touch-technologies and clinical examination in hearing and sighted communities, through to tactile signing in deaf-blind communities we explore ways in which touch is used as a resource for makingmeaning, and unpack the multiplicity of meanings attached to the term itself. One question that is central to our discussion is whether and if so, how, touch can represent and communicate meanings and develop into a ‘mode’ that can serve a ‘full’ range of semiotic functions within a community. The paper has been accepted for publication as the opening article of a special issue of the Australian journal of Language and Literacy. Bezemer gave a talk on the partnership with surgeons underpinning our research project and also drew on the project in a workshop on video analysis at the Researching Medical Education conference. Two more book chapters were accepted for publication, each highlighting methodological challenges in the project. In this quarter we have begun to analyse our data set from two new angles, addressing emerging theoretical and methodological challenges in the field of multimodality and substantive questions about learning and communication. The first angle is ‘touch’. We are investigating excerpts of video recordings of surgical operations to explore the role of touch in surgical training and learning more generally and the impact of (digital) technologies on touch, in surgery and beyond; develop asocial semiotic multimodal account of touch and reflect on methodological implications of touch. The paper will be written up for the opening article of a special issue of the Australian journal of Language and Literacy. The second angle is ‘text trajectories’; We will investigate the relation between abstracted representations of the human body (in textbooks, virtual reality, simulators) and actual patients and its implications for learning; and explore a ‘mixed methods’ approach, combining textual analysis and interactional analysis. This analysis will be written up for a special issue of Text and Talk. In this quarter Bezemer has continued to analyse a set of 14 video recorded operations through detailed multimodal transcription focused on decision making. This feeds into a journal article which is nearing completion. Bezemer also wrote a chapter for an edited volume documenting and theorizing how we achieve impact in the project through cross disciplinary partnerships and forms of analysis that move beyond traditional qual-quant dichotomies. The ‘impact film’ commissioned by the ESRC around ‘how surgeons learn to operate’ is now published, and so is the journal article that reports that part of our research project. The NCRM have commissioned and published a podcast on the project. We also did another rendition of the ‘How do surgeons learn to operate’ event at the Cheltenham Science Festival on 7 June 2013. We have been discussing the role of digital laparoscopic video in the teaching and assessment of surgical trainees with a number of surgeons with a view to identifying potentials for collaboration and impact. The research has also been discussed at national (Milton Keynes, Preston) and international symposia (Wurzburg, Sao Paulo) and in the context of various MODE training events, including one event targeted specifically at medical educators which Bezemer ran with a project partner from the Oxford Deanery (Alex Cope). In this quarter we have focused on dissemination and impact. We ran the public engagement event ‘How do surgeons learn to operate?’ at the Science Museum’s DANA Centre, which was well received by an audience of 70 members of the public (see photo). The Science Museum fed back: “We had some really great feedback from the audience. Most people really enjoyed theinteractivity of the event and being able to discuss things openly with experts, as well as try different activities. In general, people thought it was a fascinating and enjoyable experience.” The event has been filmed and forms the backdrop of an ‘Impact Video’ commissioned by the ESRC which showcases the research project. Bezemer has also been interviewed for the NCRM podcast series. A key output of the project which shows how laparoscopic video footage can be used to analyse how surgical trainers and trainees achieve surgical care when the trainee operates under the supervision of a trainer has been accepted for publication in the Journal of Contemporary Ethnography. Bezemer submitted a chapter for an edited volume in which he reflects on the project in terms of the potentialities and constraints of multimodalmethods for helping to improve surgical care. Bezemer has also given a talk at the Technology, Health and Society Forum of Queen Mary University on Video technology in the operating theatre: Impact on clinicalpractice and potential for social research; and drew on data from the project in a talk at Tilburg University, Netherlands, on linguistic diversity in the operating theatre. 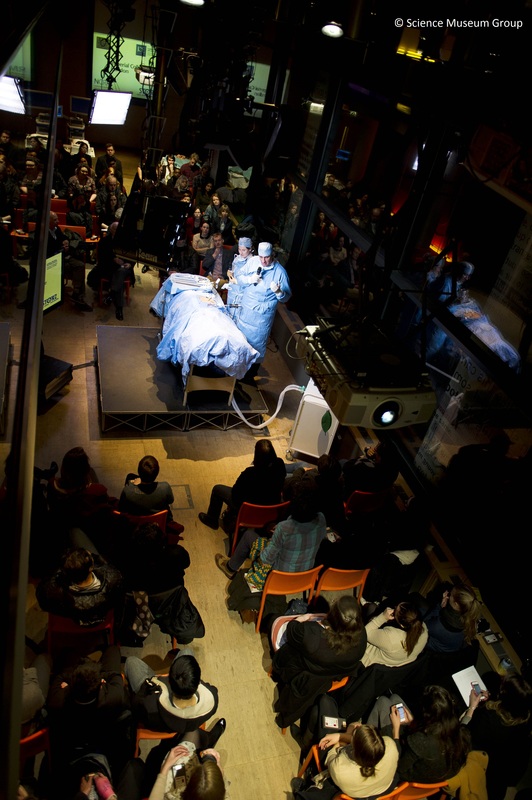 In this quarter we have developed a public engagement event called ‘How do surgeons learn to operate?’ which will be held at the Science Museum’s DANA Centre on 20 Feb 2-13, 7-9pm. DANA events typically accommodate about 80 adults and are aimed at facilitating interaction between researchers and the general public. The event will involve ourselves and some of the surgeons we have worked with. They will re-enact an operation, and, drawing on the research project, we will explain exactly what surgical trainees and their supervisors say and do as the trainee applies the scalpel inside a patient to ensure that the trainee does no harm to the patient. The event showcases a part of the project that was written up for the Journal of Contemporary Ethnography where it is currently under review. Bezemer presented a paper on other strands of the research project in Denmark and participated in the first meeting of a European network on multimodal methods funded by the German Science Foundation discussing the research project. He also worked on a chapter for an edited volume (to be published by Palgrave in 2014) in which he explores the potentialities and constraints of the methods he uses for addressing the UK’s health policy agenda. This chapter is due to be submitted in Jan 2013. In this quarter we continued to work on the analysis of the 10 video recorded surgical cases collected last year. This work is developing along three lines, substantive, methodological and theoretical issues. As for substantive issues issues we have analysed the 10 cases with a focus on decision making, which is a key topic in current surgical and psychological literature. This analysis has been written up in draft form and will be submitted to Social Science and Medicine in the next quarter. As for the methodological issues we have explored the potentials of various methods of (micro-)analysing laparoscopic videos (ie ‘naturally occurring’ digital video-recordings made with the cameras used in key hole surgey). One promising, tentative result in this area is that multimodal transcription software might be used to make ‘intuitive’, expert judgements of the instrument handling of surgical trainees explicit. In terms of theory we have made progress developing a social semiotic multimodal perspective on communicating and learning in digital, i.e. screen mediated work environments. Dissemination activities have focused on all these three areas (see output).